Sepsis is a disease that is prevalent and has a high mortality. We now have a lot of emphasis being placed on early diagnosis of sepsis, early antibiotics, and early source control. We know that ultrasound can find a lot of potential causes for sepsis, and it can potentially saves some time in doing so. This article takes a look to see how the diagnosis made with ultrasound compares to a traditional work up - both in time and accuracy. There were a lot of scans using a variety of probes. If you don't know how to do any of these, check out the videos below! 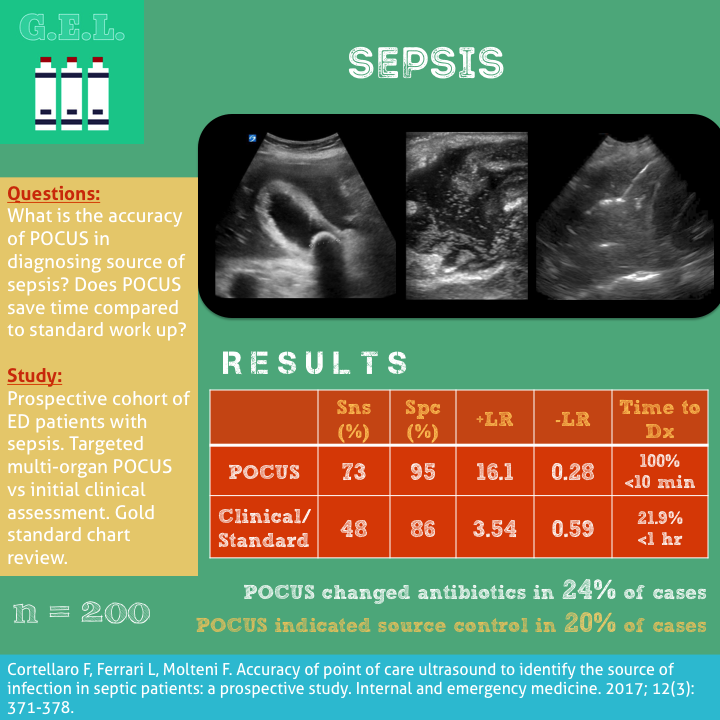 POCUS diagnosis changed antibiotics given in 24% of cases - and it was in an appropriate change in accordance with final diagnosis as determined by chart review (except in one case of malaria). Same physician treating patient and performing ultrasound. On the one hand, this could bias someone to see something that they already suspect; HOWEVER, this is actually how POCUS is supposed to be used - by the provider, for the provider. Therefore, this is actually a good thing about this study, it reflects what should be happening in clinical practice. They also did not allow the initial diagnostics ordered to be changed. Fairly advanced ultrasound skills - diverticulitis, appendicitis, endocarditis? These guys are pros. This may not be externally valid if you are not an Italian POCUS all-star.